Hyundai (HYMTF) and its stablemate Kia have been taking U.S. auto market share gradually, bit by bit, for more than two decades. Lately, though, those chunks have gotten bigger, as the low-priced, high-quality car firm has begun to poach more domestic sales from Japanese manufacturers. And the trend is accelerating. The South Korean car makers' sales are expected to surge almost 25% in September compared to the same month year ago, according to research firm Truecar. Hyundai and Kia are projected to sell more than 95,000 cars and light trucks in the U.S. this month. That would put the duo ahead of Nissan (NSANY), which is expected to sell 89,000, and slightly ahead of Honda (HMC), which has been the Japanese value-car leader for years. Sales of Japanese cars have been limited due to production slowdowns caused by the earthquake in March. Hyundai's and Kia's combined sales are moving within striking distance of Chrysler, the No. 3 U.S. car company, which is expected to sell 120,000 cars and light vehicles this month. If Truecar's projection is correct, Hyundai and Kia will have a 9.1% share of domestic sales, up from 8% in September 2010. How are the South Korean manufacturers doing it? First, the company has earned a share of the quality image that was once Toyota's (TM) signature. 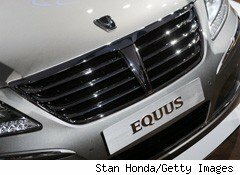 Hyundai's flagship Equus luxury model recently won the J.D. Power award for large premium cars in the 2011 Automotive Performance, Execution and Layout category. The Hyundai Azera received the top award for best large car in the Ideal Vehicle Awards given by AutoPacific. Hyundai has also been clever about how it markets its trade-in and warranty features. The firm's Assurance Trade-In Value Guarantee sets prices for cars traded in during the 24th to 48th months they're owned. The manufacturer also has a 10-year power train warranty. It is impossible to say what these programs cost the South Korean firm compared to warranty programs offered by their competition, but Hyundai/Kia is clearly willing to make such investments to keep gaining market share. The domestic car market isn't growing as quickly as it was in the early part of the year, and several car companies cut their estimates for total domestic vehicles sales. Ford (F) recently dropped its forecast for U.S. 2011 sales to less than 13 million. But Hyundai/Kia continues to invest in efforts to earn market share now, so it will be positioned to capitalize when the U.S. auto sales rebound picks up speed again.